Version 2.0 of our popular WooCommerce protected content plugin is now available. It comes with major new functionality to restrict WooCommerce categories to specific logged in users or roles. The new version builds on the existing options to password protect categories or mark them as private. This makes it a complete solution for any WordPress site needing to protect WooCommerce categories. Our WooCommerce protected content plugins have several thousand users in over 75 countries worldwide. Since they were first released 2 years ago, we have collected lots of feedback and feature requests from our customers. Many of you have asked for extra ways to control which users can access protected product categories. The new version includes the additional options you asked for, and more! Keep reading to learn about these exciting new features and how to use them. Start protecting your WooCommerce content in new ways today! The plugin was previously called ‘WooCommerce Password Protected Categories‘. The new user and role protection features mean that has outgrown its original name. As a result, we have renamed the plugin ‘WooCommerce Protected Categories‘. This reflects the fact that it provides a full range of options for creating WooCommerce protected content, instead of just password protection. If you’re using password protected categories then it’s a pain for administrators to have to enter the password to view the category. Now you can bypass this by automatically unlocking your password protected categories for administrators. If you’re creating a wholesale store, then you might want a dedicated ‘Wholesale’ product category which is visible to logged in B2B users with a ‘Wholesale’ user role, but hidden from regular customers. That’s possible too! A private WooCommerce members-only store might create a protected category and make it available to all logged in user roles, but hidden from public view. All its sub-categories and their products will automatically be restricted too. They can then create a members-only shop with multiple categories, only visible to logged in users. With the new version, it’s easy to restrict WooCommerce protected categories to 1 or more specific user roles. Simply head to the Add/Edit Product Category page in WooCommerce, and choose which roles can access each category. A huge number of people use our WooCommerce protected content plugin to sell user-specific products. Until now, the only method to do this was to create a separate password protected category for each user. To access their hidden products, customers had to visit the category page (or a central category login page) and enter the password. They would then be directed to a page listing their customer-specific products. This option has always been popular, but it didn’t meet everyone’s needs. For example, some store owners don’t like asking their customers to enter a password to unlock their protected category, and later enter a separate username and password to log into their user account at the checkout. Understandably, you told us that customers should be able to login once to unlock their hidden products and make a purchase. With the new WooCommerce Protected Categories plugin, there’s no duplication. Just go to the Add/Edit Product Category screen in WooCommerce, and choose 1 or more users who can access the category. As you can see, there are now several options for creating WooCommerce protected content. Even better, you can combine the options to create more advanced content protection rules. You can add a product to as many protected categories as you like, each one restricted in different ways. Sub-categories and their products automatically inherit the protection rules of the parent category. A wedding photographer can create a password protected category and give the password to the happy couple and their guests. They can use the new user role protection to automatically unlock the category for administrators. This lets the store owner view the customer-specific categories without having to enter a password. You might create a hierarchical category structure where Category A is password protected and has 3 child categories: B, C and D. You could leave Categories B, C and D inherit the same password protection as Category A. To create multiple rules for your WooCommerce content, simply choose the ‘Protected’ option for any product category. Next, add whichever types of protection you require. 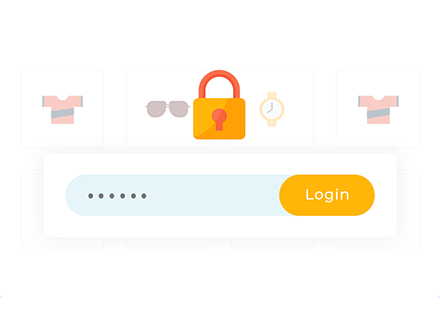 The WooCommerce Password Protected Categories plugin has always had an option to show or hide protected categories and their products from the public parts of your store. With password protected categories, guests see a password login page if they ever try to access a protected category or product. Show 404 error – The guest user will see a 404 error, so it looks like a broken link. This is a good way to hide the fact that your hidden WooCommerce products exist at all! Show WordPress login page – You can redirect logged out users to the default WordPress login page (/wp-login.php). Show custom page – This is my favorite option. It lets you redirect logged out users to any page on your website. For example, you could redirect them to a front end login page. This will look more professional than the back end WordPress login. Alternatively, you could create a ‘Members Only’ page which explains that the page is protected and includes a signup form encouraging them to join. The choice is yours. Where can I get this WooCommerce protected content plugin? We’re offering the plugin as a free upgrade for existing WooCommerce Password Protected Categories users. If you’re already using the plugin, simply go to Dashboard > Updates in your WordPress admin, and update to version 2.0. You can then navigate to the plugin settings page and the Add/Edit Category screen, and start using the new features. If you haven’t got the plugin yet, get WooCommerce Protected Categories now. It just takes a few minutes to set up, so you can have your WooCommerce protected content up and running in no time!